In June this year our Reservations Manager, Seraphina Berry, completed a recce trek of our new Three Peaks of the Balkans trekking holiday. This made her one of a very select band of trekkers who have walked along the Balkans Peace Trail which straddles the mountains of Kosovo, Albania and Montenegro. Here's what she told us about her exhilarating experience. Where does this trek go? After a 3 hour drive from Pristina (the capital of Kosovo) into Albania, the trek starts in the beautiful Valbona Valley which is situated in the Accursed Mountains region. Over the course of 7 days, the trek criss-crosses the borders of Montenegro, Albania and Kosovo ascending from lush valleys, through picturesque meadows to high peaks including the summit of Gjeravitza, the highest mountain in Kosovo. There is a welcome rest day in the middle of the trek in the fascinating Kosovan town of Peja and it ends in the historic town of Gjokova before returning to Pristina. Have you been to the Balkans before? Yes, in 2014 I completed our Accursed Mountains Trek which, like Three Peaks of the Balkans, walks along sections of the Balkans Peace Trail. In fact, if you complete both treks you will have done virtually all of the 120 mile long trail. What is the Balkans Peace Trail? 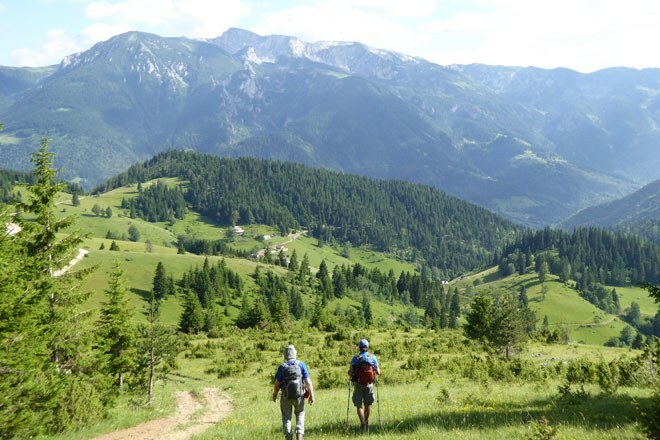 Founded in 1999, the Balkans Peace Park Project is a sustainable tourism initiative that aims to preserve the fabulous flora and fauna of the high mountains region of the Balkans and to help the local people sustain their centuries old lifestyles. As part of the project, a long distance walking path has been established that winds across the borders between Kosovo and its neighbouring countries of Albania and Montenegro. This innovative project bears testament to the more harmonious future being fostered between the people of the region who experienced the trauma and divisiveness of the Balkans war only two decades ago. What made this part of the Balkans so special for you? Without doubt, it was the people. Their warmth and hospitality knows no bounds, rather like their seemingly bottomless bottles of raki (homebrew). They are surprisingly demonstrative and always gave us a hug when we arrived or moved on and they just loved to have their photos taken. How much time did you spend with the local people? Our guide was from the region and he accompanied us throughout. His knowledge of the history, culture and cuisine of the Balkans was invaluable, as were his language skills as English is not commonly spoken in this part of Europe. We spent all but one night of our trek in simple village homes and guesthouses, often eating and socialising with the family who lived there. One of the aims of the Peace Project is to revive and sustain mountain culture and traditions and we certainly got a real sense of that on our trek. Unbelievably wonderful! Food and hospitality is immensely important in the Balkans. Their food is very rustic and simple but always fresh and often home grown or home produced. We ate a lot of delicious fruit, vegetables and salads fresh from the gardens of the guesthouses we stayed in as well as a lot of dairy products, especially sheep’s cheese. Aside from the raki, we drank lots of herbal teas, again using herbs picked fresh from the garden. These were wonderfully refreshing and reviving after a hard day on the trail. Did you see many other trekkers? Very few indeed - no more than eight during six days of trekking in the mountains. It’s hard to convey just how remote and undiscovered this part of Europe is. In fact, it felt more akin to tea house trekking in the Himalaya many years ago than trekking in Western Europe. What was the trekking like and how varied was the scenery? This is a tough, rugged trek with over 1,000m of both ascent and descent every day – not unlike walking up and Snowdon each day for a week. There are also three peaks to summit although these are completely non-technical trekking peaks that can be successfully tackled with nothing more than good walking boots and lots of stamina. Our luggage was carried by horse or motorbike so we didn’t need to carry anything more than a daypack and we also had a day’s sightseeing in the middle of the trek which allowed us to rest our weary legs. All the exertions were worthwhile though as the scenery was simply stunning and surprisingly varied. We walked through beech and pine forests, crossed pristine alpine-like meadows full of colourful flowers, hiked along airy ridges and encountered many tarns, mountain lakes and impressive rock formations. The views were simply stupendous from start to finish. For four nights of the trek we stayed in simple guesthouses with shared rooms and a hot shower. Following local tradition, our meals were prepared and cooked outside on wood burners and we ate with our host family in their garden. We also spent two nights high in the mountains in a shepherd’s hut. This accommodation was very basic with a single dormitory room and earthen floor. Beds were on a raised platform with good, comfy mattresses and lots of warm bedding as it can get pretty cold. If you don’t mind ‘roughing it’ this is a wonderfully authentic experience which we absolutely loved. Two nights are also spent in hotels for a bit of extra comfort. What flora and fauna did you see? Myriad wildflowers carpeted the meadows making them a riot of colour. Our guide did tell us all the names but there were just too many to remember. I do recall lots of tiny blue gentians as well as delicate, rare orchids. It was a botanist’s delight. Apart from foxes we didn’t see many wild animals although wolves and bears are present in the mountains. We did see birds of prey and many other smaller birds some of which were familiar and others I’d not seen before. We ate breakfast around 7am which comprised fresh bread, eggs, yoghurt, cheese and tea or coffee. Most of our walking days started directly from our accommodation and there was always a good amount of ascent and descent although mainly on good paths or dirt tracks. There is very little motorised transport in the mountains so we rarely encountered any vehicles. After walking in the morning for 3 or 4 hours we stopped to enjoy our simple picnic lunch of bread, cheese and tomatoes, before continuing for another couple of hours. Most days we reached our next accommodation between 3 and 4pm. We were always welcomed with hot drinks and raki before having time to freshen up and relax before our evening meal. Did you spend any time in the local towns? We took a break from trekking to visit the small town of Peja in Kosovo. The key sight here is the exquisitely beautiful monastery of Visoki Decani which is an important Serbian Orthodox monastery. Designed by a Franciscan monk in the 13th century it is home to 24 monks who make cheese and brandy. Understanding the history of the monastery and the town provides a real insight into the complex background of the Balkans war in the 1990s. The monastery is in fact still protected by members of the NATO KFOR peacekeeping force who have retained a presence in Kosovo. We also visited the caves at the source of the White Drin river and experienced the popular Kosovan pastime of eating trout! The trek ends in the town of Gjakova which is a fun place to spend your final night with lots of cafes and shops full of the local people enjoying the balmy summer evenings. We don’t include time in Pristina in our trip itinerary, but it would be easy to organise an extension and there's plenty to see and do in Kosovo’s principle city. Evenings spent enjoying a hearty meal and sitting round a fire with our guide and hosts provided some of the real highlights of the whole trip and gave me memories to treasure. In terms of the trekking, the wow moment for me was in the Doberdol Valley when we crossed a pass and had amazing, panoramic views of the dramatic mountain scenery beyond. I can't recommend trekking in the Balkans highly enough. Who is this holiday ideal for? It’s perfect for the Alpine trekker who wants to experience something more remote and undeveloped without having to travel too far from home. To enjoy the trek, you need to be a strong walker and be happy to spend nights in shared accommodation – not dissimilar to mountain huts – so a good level of tolerance and a sense of humour will certainly help get the most out of this fantastic trip. Hi! Lovely blog post. My friend and me also want to hike for 7 days september 2018 but don’t know where. This hike looks really nice but we were wondering: is it safe enough to walk (2girls) there?